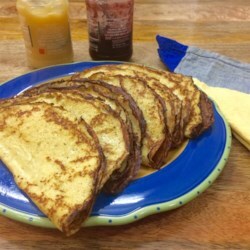 Don't really know why I tried this recipe since I am born and raised in sweden and should know my "pannkakor" but I did and it's not quite right. I really like my recipe better wich is basically changing the flour to 1 cup and take away an egg or two depending on size. I also usually substitute 1/3 of the flour to whole wheat flour. We also usually eat our pancakes with strawberry jam or other kind of jam. I make them in a 10 inch pan with low edges with a long spatula I bought at IKEA. Just use your wrist to turn the pan to spread the batter out. If it gets stuck just use som butter on the pan. This recipe can also be used as an oven pancake if you add some fried bacon pieces in an 9x13 bakingpan and bake in the oven at 450 for 25-30 min and serve with lingonberries.